Newgrange occupies a unique place in the landscape and imagination of not only Irish people but others who travel from all over the world to visit this ancient monument. Pre dating the pyramids this megalithic structure is precisely aligned to the winter solstice on the 21st of December. The rising sun gradually illuminates the carved standing stones of the passage eventually reaching ot the innermost chamber of Newgrange. While weather is always a factor, it has to be perfectly clear for the sun to illuminate the chamber, those in the know stalwart hippies and archaelogists have noted that while it may not happen perfectly on the exact day it will happen on one of the days either side of the soltice. Which was hugely important back then as it marked the end of the winter or darkness and the return to longer days and brightness as the sun starts to broaden its path on the horizon. 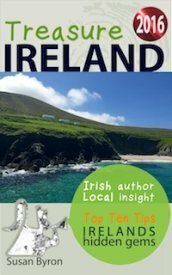 There has been a huge return to these ancient customs and celebrations in Ireland with many people hosting soltice gatherings of their own as we have literally 1000's of other less known monuments with solar and or lunar alignments even though Newgrange inevitably grabs the limelight sorry sunlight on the worlds media stage. Still it's special, and very much part of our rich, ancient culture and heritage. You really should come and see for yourself. 1 Knowth passage grave complex decorated curbed stones, alligned to the equinoxes. 2 Mellifont abbey 12th century Cistercian abbey with octagonal lavabo, retrace the footsteps of 800 years as you cross the threshold stone. 3 Slane village, check out the four large houses opposite each other at the crossroads, originally belonged to four sisters. 4 Slane Castle peep over the green gates to see the site of the legendry open air rock concerts run by Lord Henry Mountcharles. 5 Cross the bridge below the town, park into the right where you can enjoy a walk or a picnic on the banks of the river Boyne. 6 Francis Ledwidge’s cottage road to Drogheda, famous Irish poet who was killed in action in Ypres 1917. 7 Drogheda town, former Viking settlement, check out St Laurence’s gate one of four original fortified tolled entrances to the town. 8 Mummified head of Saint Oliver Plunkett on display at St Peter's Church in the centre of town. 9 Termonfeckin delightful small village and golf links on the estuary just north of the town. 10 Beaulieu House a very fine and unusual country house on the banks of the river Boyne which has been in the same family since 1640. 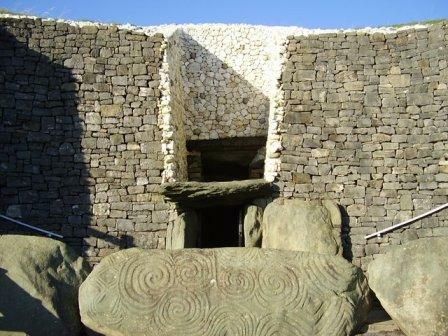 For more information on Newgrange please click here.